"Buffing themselves" ... wrong wording on my site. But a warden can go 70% and above. Just a quick test with a simple group setup (Capi. Mini and me), and as you can see (on Light of Earendil) i didn't changed everything on my thank warden yet, so i could go for more with a bit of gear change. a beorn can get 81% mitigation without the armor set bonuses with cap and mini. If you are still requesting a buff to the armor phys mits and tact mit %, I would suggest stop. you're buffing yourself out of a job. At the very least, a change such as nerfing Oathbreaker's Shame should have waited until Captains got their pass like the rest of the classes so we have someone focusing on the class and willing to have a dialogue with the players. If you are still requesting a buff to the armor phys mits and tact mit %, I would suggest stop. you're buffing yourself out of a job. The discussion was two way: vitality set vs. mitigation set. As i said a tank will go for vitality set, other said no because of this and that. Then i showed that a warden doesn't really need the mitigation set. For a guardian it would be good, if the set bonuses would be meaningful. It is nonsense to put physical mitigation as set bonus on the (heavy) armour as the 4 resp. 6 piece bonus, meanwhile tactical mitigation is much harder to achieve and most of the mobs will do tactical damage in the raid. And don't blame me if the Beorning mitigation is now too strong: tell it SSG, to balance the classes and content better! It is a very dull argument, to use a broken class as excuse, why a set-bonus on the raid armour shouldn't be more meaningful and balanced. You might not be aware of it, but those +% mitigation setbonusses dont raise your rating, they raise your percentage mitigations. If you have 70% now with your warden and get the sets for +2% mitigations, you'll have 72% mitigations. Thats quite good. And why did you write "can buff themselves to 70%+", when you implied having external buffs? Any tank can get a minstrel for +3% mits, a cappy for +3% mits (and dont blue cappies give some tactical mit % on top of that? ), a RK for -10% incoming damage... but thats not "buffing themselves". Thats why people usually compare tanks without the buffs everyone can get. And there, warden is capped on 65%, guardian on 73/70%, beorning on 75/65%, captain on 60%. The higher your x% mitigations are, the better are +x% mitigation bonusses. +6% via captain plus minstrel are standard. The new sets allow heavies +4% on top of that, so +10%, setting guards at 83/80, beornings at 85/75, captains at 70.
and wardens, as they cant wear heavy armour, just 73 or something like that. If you run with 200k morale (which will be the lower end for tanks tanking the raid in higher tiers), getting +2% mitigations while going from 70% to 72% raises your effective morale pool from 666.7k to 714.3k. If you instead get +4k vitality, so +20k morale, your effective morale pool raises from 666.7k to 733.3k. Thats better, but requires more heals. Now, do the same calculation for a beorning, who has the choice to get +6k vitality or +4% mits and is already at 81% physmits. He starts with a morale pool of 200k, effective morale with 81% mits is 1052.6k. If he raises his morale by 30k, he'll end at 1210.5k. If he raises his physmits by 4%, he'll end at 1333.3k. So in this case, the higher mits are clearly by far the better choice. And I wrote, that 200k morale will be the lower end of the spectrum. The higher your morale already is, the better the mitigations bonusses are. Last edited by Oelle; Dec 11 2018 at 06:34 PM. Hey all just following up on few things I feel need to be addressed on beta or atleast reevaluated. #1 Oath breakers shame CD on target buff should be reduced to the cooldown of the skill itself this would nullify the OB reset set and still make ob useful in these 10+ minute fights the raid brings. #2 I hear a lot talk about the lore description on the armour its not really my thing but hey no harm in having it. Keep doing what you're doing some players enjoy it and that's the goal isn't it? Although I do have a concern about these raid set bonuses which is they are not class specific I really would like for t1 and t2 sets to be what we see now on live but for t3 it should be class specific which will affect certain skills on certain classes. My reason for this is if I can get to cap stats with purple essences and t1 raid gear on beta what will I get 6 months from now with golden essences? and maybe golden jewels? The stats will be very much over flowed this and this is problem I can foresee so I will follow up on this issue by again saying please make t3 sets drop only and class specific. #3 my last feedback is saluting the developer team on Thikul Gundu and this new raid I do like them both and is abit refreshing after the naerband era so good job on that you have made 1 player happy. #4 Thanks for normalizing pvp monster player dot damage its quite radical on live and Ive heard nobody thank you for this so I will take time to say thank you and Im looking forward to february once class changes finished for when the team will focus on updating PvP for lotro. I see it the same way and I think your remarks are good. Also, as you said, tanks should be compared without groupbuffs (at most the +% with sets can be included). Wardens will be the worst tanks after balancing the Beorniger and I don't think that can really be denied. What sense does it make to have a class that is already harder to play than the other classes anyway, if this extra effort is not reflected positively somewhere, but has even become a disadvantage? A high percentage of mitigation (according to the current game design) will always be the best way to make a tank tanky. And Guardians and Beorniger in the group are now ~10% ahead of Warden. We do have a little more mitigation than captains, but the wide range of buffs and utility makes a tank captain almost indispensable. Just compare (see my previous post in this thread) what makes the tanks unique/desirable. Beorniger will shine with very high mitigation and strong offensive buffs and a strong defensive cooldown. The Warden won't be able to compete with him as a tank either. We need longer buffs for ourselves and some more mitigation OR stronger buffs for the group (be they offensive or defensive). So many good suggestions have already been made - just check out the Warden classforum or the warden beta feedback forum. Please don't let us down! Last edited by Imbrahil; Dec 12 2018 at 06:46 AM. Your post is only true, if you ignore that champions too have a tanking traitline. You're right again - I didn't mention champions or think about them either. Apart from that, I think it's relatively safe to say that a smaller part of the champion community is worried about their tank role than the Warden community is worried about their tank role. Champion tanks have never really been a thing and I think they are more interested in being competitive singletarget DDs right now. That is good for what? In the case of warden, it is only good if one play the lazy way. In the case of the guardian: it is as good as noting (spoken here about the only 2% tactical mitigation. As i said: maybe the 2 piece bonus, but the rest is junk. It is simple not good enough for heavy armour and a warden don't need it. If the 70+% is not enough mitigation, then the additional 2% will not help you anyway. I already wrote: "wrong wording on my side". You didn't read that, right? Sorry to both of you, but that is just wrong. 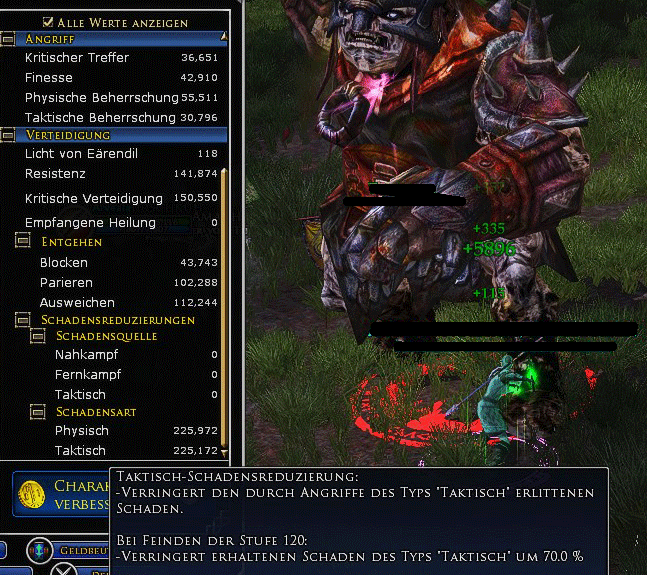 You do not do raid alone, you do not do instances like Thikil Gundu T3 alone. In a Raid you have buffs and you will and need to calculate with them. Many times it is this calculation what decide between success and failure. Do we have a capy/LM etc. for mitigations, buffs etc. If you are calculating group-content without calculating group buff etc., then you are doing wrong. This would be only true if we wouldn't have percentage based moral damage in the game. But we have it. And that kind of damage doesn't care about any mitigations. That's why this kind of calculation is nice to do and to post to have something beside the weather to discuss, but has no value otherwise. I do not calculate something that is not existing. The beorning maybe will not be a viable tank. To many ppl was crying about it and as you should know, that SSG will rather nerve things in to the ground just on suspicion, instead to test them. *LOL* I got it now! Sorry, i didn't get your subtle irony and the jokes earlier. Shame on me. If you include percentage based damage for any calculation, you get harder to heal the more morale you have, but higher mits are no issue at all. So if you do this, higher morale is clearly the worse choice. Okay, then dont include beornings. Still, if you take a class with higher mits, the mit bonus is the better choice, both for percentual and normal damage. If you take a class with lower mits and with more moral percentage bonusses, more morale/vitality is the better choice for effective morale, but morale is never a good choice for percentual damage. I'll make the guess, that Guardians will be better with the mit bonusses, while it may be better for champs and wardens to take morale... then both sets will be viable. Where is the issue? 200k morale with 73% selfbuffed physmits plus 6% from minstrel and cappy means 952.4k effective Morale. Thats the starting point. Add 30k morale (full vita) and you'll be at 1095.2k. Use +4% mits instead and you'll be at 1176.5k. No. You nee to take both into account as we will have both kind of mechanics. "pure" damage and percentage based damage. Once more: yes mitigations are good, but the raid set offers the wrong ones and the +2% phys. mit. for the 4 resp. 6 piece bonus is not worth to go for! Is is not difficult to be on cap with the new raid set with phys. mit (as a tank with shield it is even easier). But you will have to slot a lot of tactical mit. essences. as it is already the case. Tactical mitigation would be much better instead of the physical as bonus and it would left space for other essences ans only for tactical mit. But let me ask: why do you bother about the raid set as some one who said many times here: "i'm not raiding"? Haß someone Analyse how much Inc g is physical and how much tactical, percentage? I would say the 2 piece Bonus +2% tac mit and +1% for sure.